(Atlanta, GA) Chilli of the Grammy Award-winning super group TLC surprised the students of Eagles Landing Middle School the morning of April 23, 2014 with their very own #ChillisCrewDay to kick off the school’s spring testing. Chilli recognized four Eagles Landing Middle School students who were selected by the Principal for their citizenship and community service setting a positive example for their peers. Reebok gifted these exemplary students with a pair of sneakers from their new collection. “I think it’s important to reward kids to keep them motivated,” Chilli said. “Yes we should reward good grades but we should also reward great character.” The students had no idea Chilli had another huge surprise to celebrate their hard work. As the deejay (World Famous G-Mack) dropped the beat for the popular dance craze “The Nae Nae,” the group We Are Toonz ran out onto the gym floor. 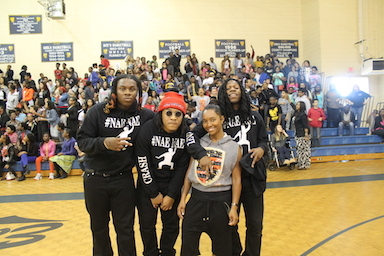 In their excitement the kids stood up in the stands and danced “The Nae Nae” along with Chilli and We Are Toonz. Following the dance performance, students from each grade had a chance to battle each other for the best “Nae Nae”. 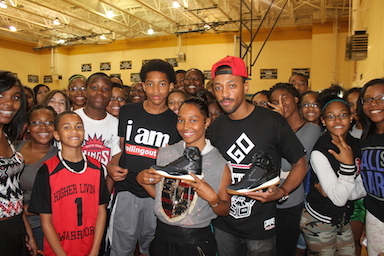 Chilli and the group gave out prizes to the kids sponsored by V-103 Atlanta and rolling out Magazine. The singer also gifted Eagles Landing Middle School an autographed poster to frame as a reminder for the students to continue to do their best in school and serve as positive examples. The spring testing kick off assembly ended with students hugging and thanking Chilli for the unforgettable morning. Chilli’s Crew Day at Eagles Landing Middle School was made possible thanks to Reebok, V-103 Atlanta and rolling out Magazine. Chilli and her foundation partnered with the school to encourage students to achieve high scores once CRCT testing begins on Thursday March 24th. She took time out to visit after coming off a promo run for Oxygen’s Celebrities Undercover and in between TLC rehearsal for their upcoming overseas tour. TLC will begin an overseas tour starting in Australia then they are off to Japan at the top of the summer. For more information about Chilli’s Crew visit http://on.fb.me/1nHVlxd or follow the foundation on Instagram and Twitter @ChillisCrew. For inquiries on membership please contact Chilli’s Crew at chilliscrew@gmail.com. For pictures and video from Chilli’s Crew Day at Eagle’s Landing Middle School search hashtag #ChillisCrewDay. Chilli’s Crew is an Atlanta based community initiative program dedicated to assisting young ladies between the ages of 13-17. Founded by Chilli, one-third of music sensation TLC, Chilli’s Crew has made it a priority to providing young ladies with the necessary resources to developing and maintaining a positive self-esteem and self-respect for themselves through empowerment and mentoring skills. Chilli’s Crew commits itself to teaching young ladies how to explore and appreciate their individual beauty and how to love themselves from the inside out.